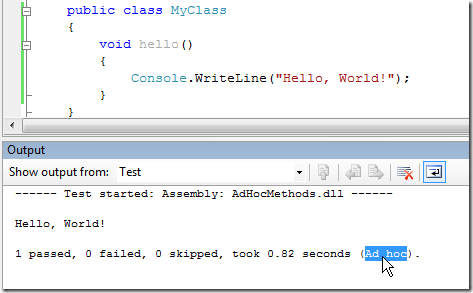 The latest version of TestDriven.Net will display the name of the test runner used in the test results summary. If the target project doesn’t reference a known test framework assembly, TestDriven.Net will use the ‘Ad hoc’ test runner to quickly execute the target method. You can see the above method has been executed using the ‘Ad hoc’ test runner. If this happens when targeting real unit test, the chances are a test runner to handle the target test type or version hasn’t been registered. This version includes support for NUnit 2.5 Beta 2. The previous version had a bug that caused tests that threw an exception to show as skipped rather than failed. If the .NET 1.1 SDK is installed and you’re using Visual Studio 2005, you will have the option to ‘Test With > .NET 1.1’. Under the covers this functionality builds your project using MSBee before executing your tests using .NET 1.1. This will now work when executed on a 64-bit OS. I’d be interested to hear if there’s any demand for this feature on Visual Studio 2008. This version once again works on Visual Studio 2003. Only one person noticed this was broken on the previous beta. Are there many projects still being developed using Visual Studio 2003? I’m using MSBee for all my legacy .NET 1.1 support. Some people have been experiencing problems registering the xUnit test runner on a 64-bit OS. It turns out the problem was due to xUnit sometimes registering itself under HKLM and sometimes under HKCU depending on what was previously installed. If you’re experiencing this problem, try re-registering xUnit (using xunit.installer.exe) after installing this version. Failed tests will now be removed from the error list when a new build starts. This prevents failed tests from becoming mixed up with build errors. I think this is the correct default behavior. You can find the release notes here and download here. 2.19 is support .Net3.5 ? Yes, 2.19 should work fine with .Net 3.5.